WebUdp8 reader bhm brought Fliqlo, a very popular screensaver for Windows and OSX to Linux. 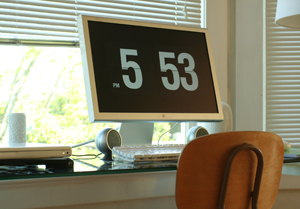 Fliqlo allows you to make your screen look like a flip-style clock. 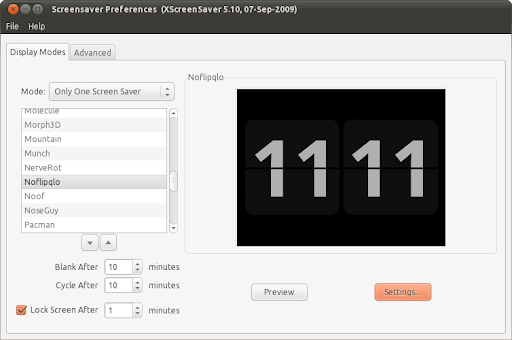 What doesn't work: Noflipqlo currently doesn't work with Gnome Screensaver so you'll have to use Xscreensaver. Also, the "flip" effect doesn't work (hence the name - Noflipqlo). If the screensaver is not centered, in xscreensaver GUI (run "xscreensaver-demo" again) go to the "Display modes" tab, click on "Settings" then on the "Advanced" button and select "Best" (this worked for me) or some other option under "Visual". The instructions may seem hard but they aren't. Anyway, if you find this to be too difficult, wait for the PPA as bhm said he'll be packaging this. 1) Anyone who knows what actual font (or any very similar) is being used in original screensaver (seen on first shot; or just google fliqlo), please comment! Right now it uses Droid Bold. 2) If you find bugs, please report.